The Emory Coordinated Care Center, located at 484 Irvin Court, Suite 240, in Decatur. A second center is located in Stockbridge. The Emory Healthcare Network has launched an innovative model of care and care coordination for older adults who are enrolled in one of five Medicare Advantage plans. Called the Emory Healthcare Network Advantage, the new model is partnering with CareMore Health Systems to bring the California-based company’s care center concept of coordinated medical care to Emory’s patients in the Atlanta area. 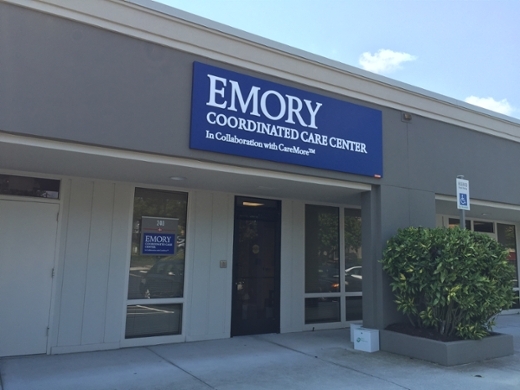 Two Emory Coordinated Care Centers, one in Decatur and one in Stockbridge, have recently opened and are available to Emory’s Medicare Advantage patients who have an Emory primary care physician. The centers, staffed by Emory employees, including a physician, nurse practitioners, medical assistants and support staff, will provide health care solutions for the complex problems of aging. The model focuses on older adults who are at risk of or have developed chronic conditions such as diabetes, heart and lung disease. For many patients, their first exposure will be the "Healthy Start" program, an hour-long comprehensive health assessment involving an examination and discussion with a care center clinician. Medication usage, lab work and other diagnostic testing will be discussed during this appointment. In addition, the patients can learn about other resources such as free health education classes and Emory’s chronic disease management programs. The results of this thorough health assessment will then be shared with the patient’s primary care physician under a highly coordinated process. "The idea behind this new model of care for seniors is to help identify chronic conditions early and address them before they worsen, while also providing wellness care and health education," says Patrick Hammond, CEO of the Emory Healthcare Network. "This preventive approach to health complements the medical care provided by a patient’s primary care physician, acting as a second source in promoting coordinated health care." Patients who already have or will choose Medicare Advantage insurance are candidates for the program. Open enrollment to select a Medicare Advantage plan begins Oct. 15. Once in Medicare Advantage, patients automatically have access to the Emory Healthcare Network Advantage Program. "This innovative partnership supplements the primary care relationship, helping seniors when they are most vulnerable, to achieve their best level of function," says Richard Gitomer, MD, president and chief quality officer of the Emory Healthcare Network. "In this partnership, we will benefit from CareMore’s expertise in delivering clinical programs within the care centers and providing robust care coordination across the health care continuum. This enhances the efforts of the Emory Healthcare Network to include our senior patients." Gitomer goes on to say, "The Emory Healthcare Network offers a true collaboration of Emory employed and faculty physicians, private practice physicians and hospitals formed to improve care coordination, quality outcomes and cost control for patients and the community. Combining the two partners will ensure that the Medicare Advantage population receives the individualized care they deserve." Eighteen Emory employees, all of whom have received extensive training by CareMore, will staff the two centers. The Emory physicians in these centers, called extensivists, will follow the patients in the hospital, in the skilled nursing facilities and for post-acute visits in the care centers. All of these services are a supplement to the patient’s existing relationship with his or her primary care physician. The range of services offered at the care centers will continue to expand over the next year to include disease management programs, wound care, pre-op assessments, post-acute follow-up and wireless health monitoring programs. Established in 2011, the Emory Healthcare Network is a network of Emory faculty and private practice physicians and hospitals formed to improve care coordination and quality outcomes as well as control costs for patients and the community. EHN members collaborate around a common set of quality measures and goals. With six hospitals, 200 provider locations, and 2,000 physicians in more than 70 specialties, including 240 primary care physicians, the Emory Healthcare Network is the largest clinically integrated network in Georgia. Emory Healthcare, with almost 16,000 employees, is the largest and most comprehensive health system in Georgia. It includes: Emory University Hospital, Emory University Hospital Midtown, Emory University Orthopaedics & Spine Hospital, Emory University Hospital at Wesley Woods, Emory Saint Joseph’s Hospital, Emory Johns Creek Hospital, Emory Rehabilitation Hospital in Partnership with Select Medical, Emory Clinic, Emory Specialty Associates and the Emory Healthcare Network. In fiscal year 2014, Emory Healthcare had $2.6 billion in annual net revenue and provided $85.3 million in charity care. It has 1,870 licensed patient beds. Emory Healthcare is the only health system in Georgia with two Magnet-designated hospitals. Emory Healthcare's core purpose: "To serve humanity by improving health through integration of education, discovery and health care." For more information, visit www.emoryhealthcare.org. CareMore, rated among the top two Medicare plans in California, has invested in developing an extensive clinical infrastructure centered on high-touch patient-care for Medicare beneficiaries and other populations. Its model focuses on prevention and highly coordinated care resulting in clinical outcomes above the national average. A subsidiary of Anthem, CareMore serves more than 80,000 Medicare members throughout Southern California, Northern California, Las Vegas, Phoenix, Tucson, Ariz., and Richmond, Va., under federally-approved Medicare Advantage contracts. CareMore also is participating in a dual demonstration project in parts of Los Angeles County in conjunction with state and federal regulators to coordinate care for people eligible for both Medicare and Medicaid.